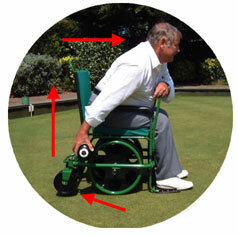 The Bradshaw Bowls Buggy is not just a wheelchair with wide wheels. It is a purpose-designed machine for playing bowls with maximum efficiency. The centre of gravity position can be moved forward or backward by adjusting the main wheel location forward or backward. This ensures all the weight is always on the large wheels and not on the small ones whatever the persons weight or size. The main wheels are very wide and are capable of dissipating over 20 stone or 140 kilos on a soft surface. By setting the wheels under the seat and inside the main frame there is no need to compromise their width because they do not interfere with the bowling action. 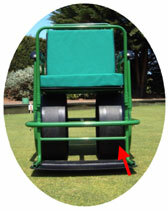 Setting small wheels at the rear ensures they cannot dig in when the person comes forward to bowl. 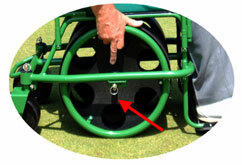 The Bradshaw Bowls Buggy rocks forward onto the large foot plate and actually lifts the small wheels off the ground!